To fill the void until we produce the planned video, here is one screen shot sample of what we are working on. A tiny part of one location that will be included in the video. Thanks for this, I'm always glad to see new shots, whatever the motif. My initial thoughts, encouragement only and not critisism. I sincerely hope it doesn't deter you from keeping to post screenshots. I am sure you are fully aware of each any every point. Are we seeing a new type of "road" here...looks like a foot way/pathway. The haze effect though still looks a bit weird to me too, I explained my thoughts in more detail before. However, seeing what appears to be the sun direclty facing the camera in this shot, I am wonder if what I am seeing is perhaps some sort of sun glare effect or something. However, you said athmosphere will be tweaked at a later date, so in case this hasn't happened yet (on second thought it probably hasn't)..completely disregard my comment. Now lastly, I am kind of wondering where the shadows went. The mountains seem to have them, and so do some trees (although for trees you explained those are fake low-pass shadows for the moment). but with the sun where it is, the houses surely should cast a shadow. This would give so much more depth to the scene. I'm also pretty sure I've seen shadows before. Lastly, talking wide into the future here.......a grass...layer of some sort would make this perfectly usable as a FPS engine. Again, I hope you don't take this as harsh, I really don't mean that. I check here daily to see new posts and I am patiently waiting. Don't feel urged to respond either btw, but I thought you might like some different comments than a simple "looks great, keep up the good work". The road is just the dirt road with another profile (single track). The haze effect - I think the perception will be better in motion, that mountain is actually rather distant. About the grass - we've been testing some some time ago, there certainly will be grass and shrubs and everything an FPS game would require. I want to consider them when designing land class and climate support in the coming months. I'm sorry about my comment regarding the houses....guess what, they actually look alot better already, all just because of the shadows. At least that's my impression. 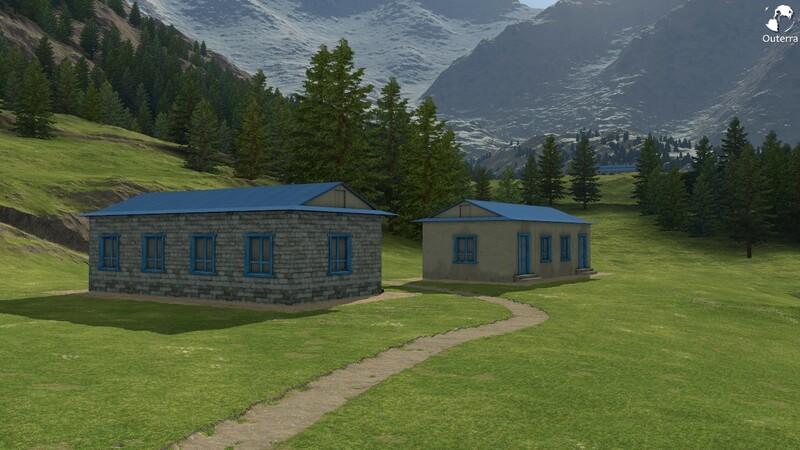 And yes, as a flightsim fan, I'd rather have fast to render houses with a small number of polys. However for a ground based kinda sim the higher the better. But don't disgress, as I said, I don't worry about it at all. Now regarding that undisclosed location, how about a little competition on the forum. You know, keep folks coming back here. Everyone can post a guess, and whoever is closest get's the beta........wooooot? Hehe, no but maybe the winner can request a little video or something that you guys make, something like some of the screenshot request you did. You know, like, could you fly from Mumbai to Mt. Everest, climb to 200k feet and shoot into the crater of....I dunno, somewhere. That kinda thing. Or something else. Or just for fun, it's all good. Team members and their families are excluded from the competition. Hey, no cheating!! Yup, Saudi Arabia, grass, snow and everything. Say a few million years ago, shifted continents and all. Cool, I didn't realize multiple times were already implemented. And continental shift and climate change too? This engine just keeps getting better and better! Getting warmer?.....err, colder. Doesn't get much warmer than Saudi Arabia I guess. Actually there are sliders for setting the day of year and local solar time of the day, and it's quite interesting to see how the position of Sun changes during the year. Continental shift isn't possible here, but there could be one for artificially generated planets. Just the transition to real data would be problematic, hm. Your second guess is incorrect too, in a way it is even more incorrect than the first one. Anyways.....even worse than my first guess you say....you're not exactly giving many hints. We know its mountainous, and we were facing eastwards. You also hinted at the houses "fitting the area". They look scandinavish to me. Lastly, and I know the greenish climate is the only thing done so far but I don't think you'd pick an area where this doesn't fit, by the flora it hints at coolish climate. I vaguely remember you refering to it as Northwestern US look (or maybe I'm imagining things). So I'll say, Norway, or possibly Washington State, or even Alaska. Alternatively, South Island of NZ. All of those would be excellent choices btw. Seeing as you said Saudi Arabia was a better than Slovakia, I would conclude NZ. There was another hint in an earlier blog posting, I think _michal would know by now. Height above sea around 3km, and since we want to show some flight sim capabilities .. The grass was just an experiment and it didn't survive iterations of development, moreover it wasn't a global solution that would fit the generated terrain properly. What's funny though, since then we have encountered one bug, a weird bumpy grass path that hinted what effect can be achieved that we didn't consider previously. 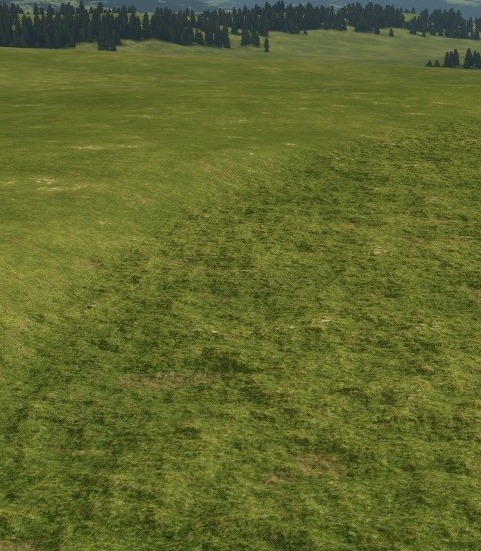 We want to exploit it for rendering of distant grass, though it will need a different fractal characteristic to get grass clumps distributed on flatter ground. Hopefully you too see the the potential there, and the good point is that it doesn't affect the rendering speed. The question is how to transition into close-up grass blades, and obviously this is just one type of grass surfaces for colder climates. Ha, I know now :-) But it wasn't really obvious earlier blog posts where in the same area as you are working on now, that's why I didn't even consider them. So, is it "a place with many goats and sheep" (dont want to give it away)? Excellent choice! The grass you are right, it looks very good as far as I can tell. Bit hard to comment more, but you are right it looks fairly natural. The trees aren't accurate and the grass should be normally more brownish there, but it looks nice anyways. Lukla, good choice! Can't wait for the video.